Kaitlyn is our Office Manager. She is married and has a 2 year old little boy named Bentley. 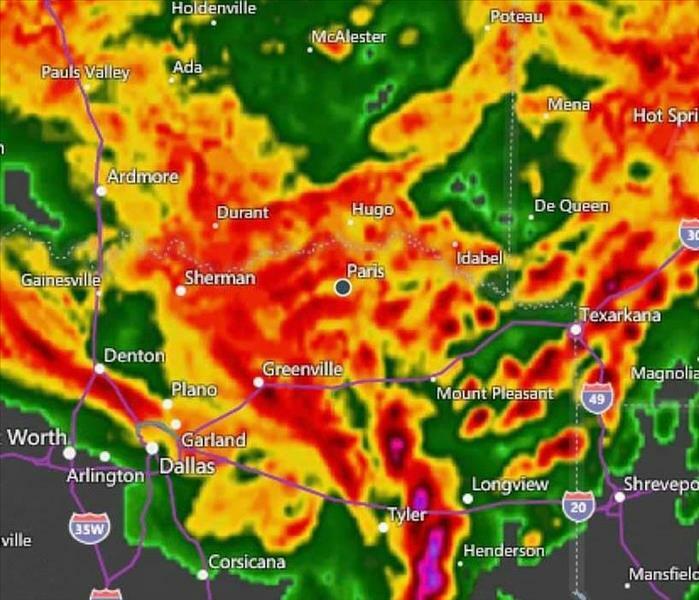 Kaitlyn lived in Honolulu, Hawaii until she was 4 then moved to Paris,TX. 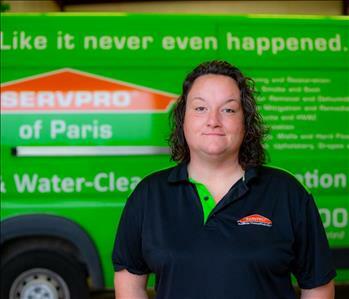 She lives working at SERVPRO because it has a fun environment, easy going and family oriented. In her spare time she loves to sleep, play soccer and softball and spend time with family. 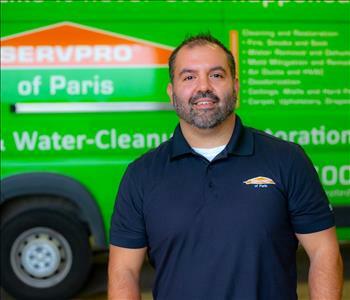 Michael Plata is our marketing manager here at SERVPRO of Paris. He has his bachelors degree in business administration. 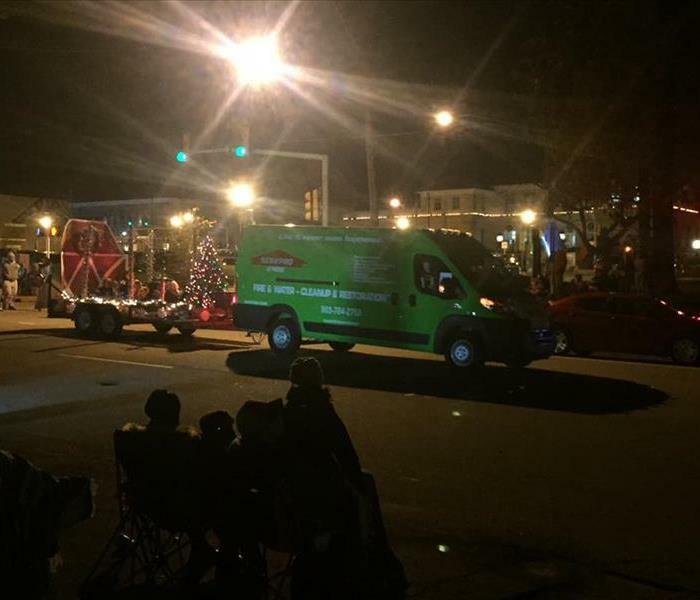 He has been with SERVPRO almost 2 years and has brought six years of marketing experience with him. He is IICRC certified. Michael is wonderful at reaching out to others and a great friendly face in the community. When he is not out and working diligently for SERVPRO, he stays busy with his wife Regan and sons Gage and Gavin. Michael volunteers his time with Lili's Legacy and church. He helps lead worship at Christian Fellowship Church in Paris. Michael is an avid guitar player and in his downtime enjoys a good game of golf and traveling. 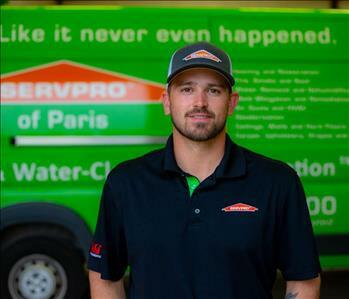 Justin Miller wears many hats here at SERVPRO of Paris. He is our production manager, commercial project manager, and also our storm team production manager. He started with SERVPRO in 2008 as a part time employee and became full time in 2013.The knowledge and experience Justin has brings a lot of assurance to the customer. His certifications include IICRC and ECPT. When Justin is not working he enjoys sports, hunting, and great outdoors. Justin lives in Powderly Texas with his wife Brittany and daughter Bryar. Justin's favorite thing about his job is being able to help people in an emergency situation. Jose Escobedo is the production manager here with SERVPRO. Jose’s experience in restoration extends eight years. He is an easy going person that has great focus on the task at hand. Jose has been with SERVPRO for five years. His certifications include IICRC, ASD, and ECPT. Jose is a valued part of our team. Family time is very important to him. He also enjoys going fishing. Jose always makes sure to bring a positive attitude to work daily. 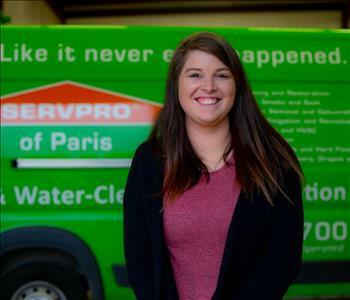 Rachel is a admin assistant here and a master in the art of being that kinda and caring person you hear answering the phones at SERVPRO of Paris. She has worked here with the green team for almost a year. she believes in making our customers comfortable to express themselves honestly. She loves the family feel of the company. " I found my second family here!" Rachel is the mother of three. In her down time shes loves playing the guitar, family time, and taking care of animals. Jaclyn Bunch is our Commercial Sales Representative and has been with the SERVPRO family for about 6 months. 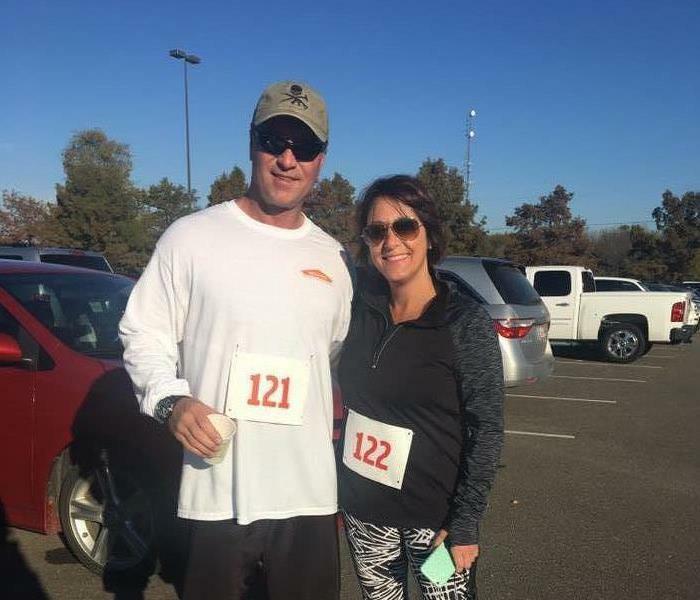 She was born and raised in Longview, TX but now lives in Paris with her husband and three kids. She has a bachelors degree in early childhood development and interdisciplinary studies. 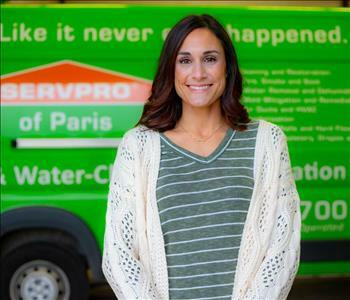 She loves the SERVPRO work environment because it allows her to travel and meet new people. Yolanda is our sales and marketing rep. She has been with us for almost a year and is married with four kids and 2 dogs. She was born in Mexico but grew up in Greenville, TX. She enjoys working at SERVPRO because she gets to meet new people when she travels and she enjoys the people she works with. In her spare time she likes spending time with family and decorating her home. Betty is one of our Production Crew Chiefs. She has been with SERVPRO for for over a year. She is engaged and has one child, Melanie, who is 11 years old. She is from Texarkana but now lives in Paris. She loves seeing the smiling faces on the customers after the job is complete and knowing that she helped make that happen. She is a great employee always willing to help go the extra mile. Patrick is one of our Production Crew Chiefs. He was born and raised in Mount Pleasant Texas but now lives in Paris with his wife and 4 kids. He loves working at SERVPRO because he gets to learn something new everyday and loves a challenge. Patrick brings a great personality and willing to help anyone to the table. Nick is one of our Production Technicians. Nick has been with us for almost a year now. 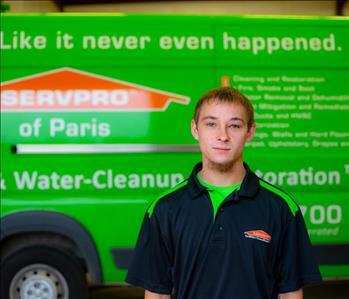 He was born and raised here in Paris and loves coming to work at SERVPRO. The best part of his job is getting to help people in need. If he is not working he enjoys fishing and watching football. Susan is one of our Production/ Soft Contents Technicians. She lives in Paris with her husband and four kids. She is originally from Mount Pleasant but decided to move to Paris to pursue a career in SERVPRO. 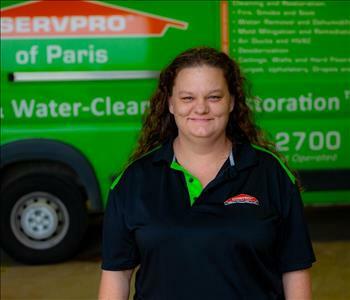 She enjoys working for SERVPRO because of the family oriented environment and how close all of the workers have become. In her spare time she is loves to binge on Netflix.